Drojan, I think you're right on some of that - where we sailed it it was more setup for cruising (it didn't have the trapeze kit), and it was the first time we sailed it. We were up against people in mostly Lasers, RS 200s and RS400s, who were pretty familiar with their boats, on a small course which didn't help. With the number of boats we sailed that week, we didn't get to spend a lot of time in many of them, so some of my reviews are "gut reaction" to the boats, and probably not that fair in some cases. You might have had a poorly set-up boat, or perhaps shot sails. 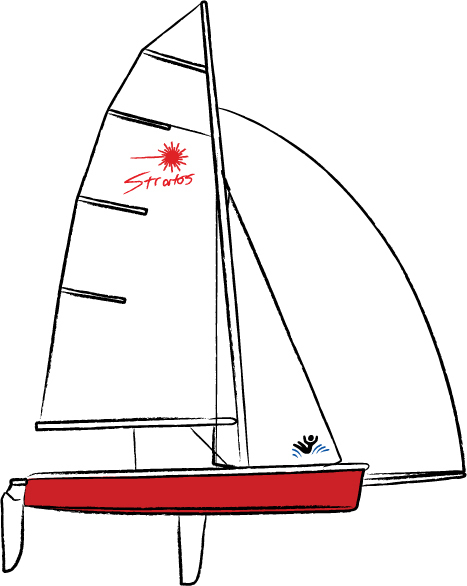 This boat is a superb boat for longer sails and handicap racing. Even has a trapeze kit which gives an added dimension to the boat. We sailed a Stratos in Greece, and while it would be a great boat for cruising with its large cockpit and heavy weight making it stable, it's not great for racing. We passed up a day sail in one of these thankfully - it would have been 6 hours in 25° heat with no wind. Instead we had a potter around, and then joined in a race. After a rather large nosebleed (watch out for the big metal loop in the back when tacking), the racing didn't go well. They don't tack very quickly, although they are quite forgiving when the wind picks up - with main, jib and spinnaker half way up, we very nearly capsized it on top of an already capsized Laser but managed to keep it going. The spinnaker is a one rope for pole launch and spinnaker hoist, a nice and easy solution. It's got good performance for a lumbering beast, but with a PY of 1083, rated very similar to a Laser, it is not easy to do well in a mixed handicap race, and we wouldn't advise it or try again for that matter.